Winter 2018 edition out now! Australian Citrus News (ACN), the national citrus publication, is the quarterly magazine of Citrus Australia Ltd. It provides focused up-to-date information in an easy-to-read style covering technical information, export and domestic markets, production developments, key industry issues, research and development progress and results, profiles and on-farm reports. 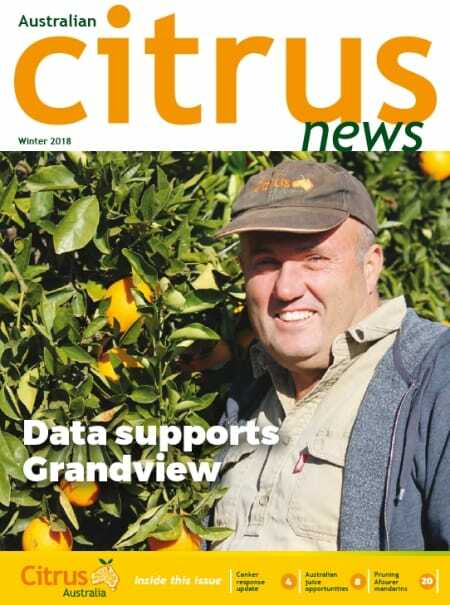 It is published quarterly with 1,600 copies distributed each issue reaching an estimated 5,000 people across Australia’s citrus industry including commercial growers, industry bodies, consultants, state agriculture departments, agronomists, research institutes, economists and the media. The magazine is distributed free of charge to all Australian commercial citrus growers. You can subscribe to the magazine too! Subscribe to Australian Citrus News here. Submit feedback or content to the Editor. Download pdf copies of past issues (members only). The ACN is widely distributed and highly circulated, providing advertisers with an ideal platform to promote their products and services to the Citrus industry. Download the ACN advertising rate card here. Email for further information regarding advertising.